Beader’s are the ultimate Artificers aren’t we?, happy fashioning glittering piles of tiny glass beads into fanciful imagining. This pendant is a gathering of elements, square, triangle, circle and half moon bails. It began when I was experimenting with glass cabochons and little scraps of art work. I have worn my teal one so often it feels like an old friend, it fits right in on formal occasions, but looks equally at home with jeans and a jumper. The kit comes in two colour ways; warm copper and pewter with pale coral accents, or dark bronze and duck egg blue with teal accents: both are available here. For those wanting just the pattern (the design will work with most 30mm diameter cabochons), it’s available in the pdf store here. Find the Stars pdf in the digital store here. It’s that time of year when Christmas isn’t quite as far away as you thought, and there’s beading to be done. 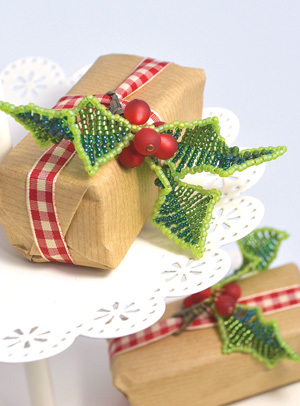 I have three quick make projects that are perfect for parcel toppers, tree decorations and, if you have an office party to go to, festive earrings and pendants too. 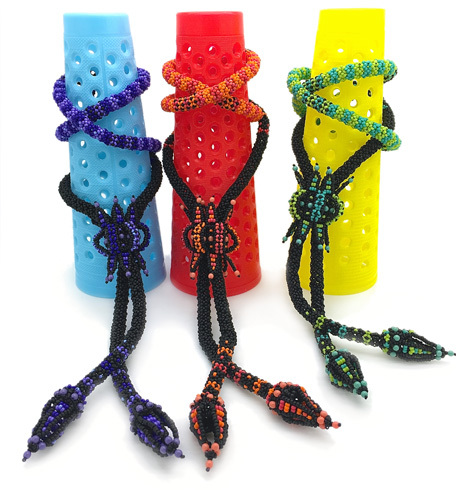 Each only uses a small amount of beads, crystals or pearls. You are welcome to make and sell these designs at the Christmas bazaar, or to fundraise for your chosen charities. 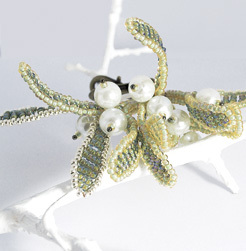 I love this little Mistletoe design and make more each year in soft pale colours. Where there is Mistletoe there must be Holly too. Sparkly and spiky in silver lined beads. Pinch me I’m Dreaming! A techniques based workshop that was great fun to teach and now available as a pdf. 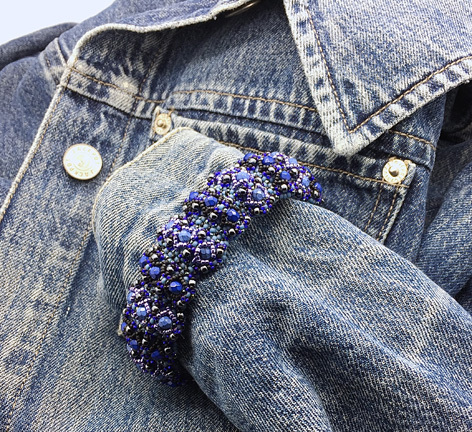 The workshop was designed to detangle RAW from CRAW and MRAW using fun ropes, necklaces, bangles and bracelets worked in seed beads, pinch beads and crystals. Included is the ‘wear every day’ bangle; a favourite for trying out new colour combinations. It’s a sturdy yet flexible bangle that can be rolled on, so it can be made a little smaller than usual, which is easier to wear (if like me, you’re not a giant jangly bangle fan). 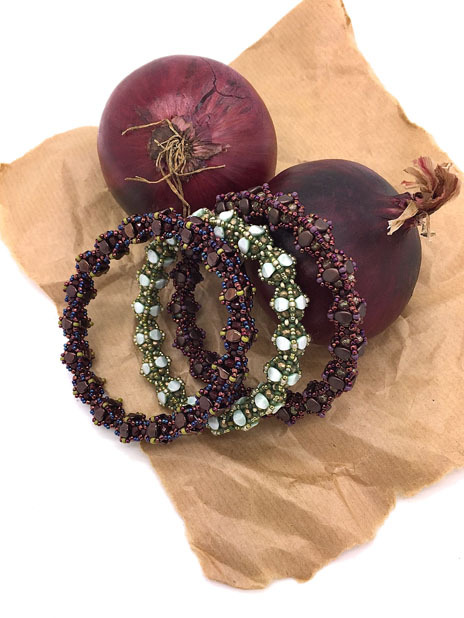 Hot off the bead mat and already being worn with a snuggly chunky knit jumper, this mix was inspired by deepest purply red onions. If you’d like to play too the pdf is in the download store here. Harlequin is a lariat for feeling joyful. Inspired by carnival costumes and full if brightly coloured beady patterns. It was such a fun workshop and now, in time honoured tradition, it is available for everyone who couldn’t make it to class. 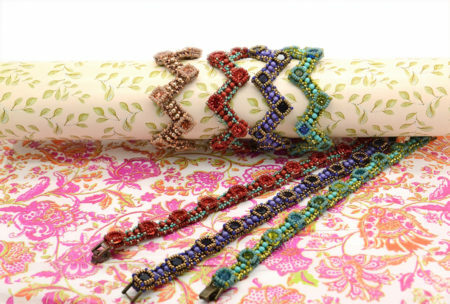 Not too complicated to bead if you have mastered thread tension… with a mix of patterned netting and embellished albion stitch. Want to use your own beads? 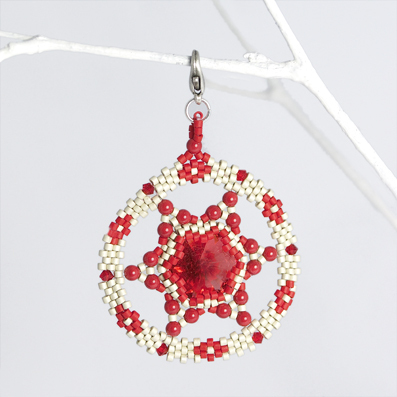 You’ll need size 11 seed beads in 3 colours size 15 seeds to match your main colour and 3mm pearls. Bethany in platinum sold out so quickly, thank you! Just to let you know it’s now back in stock. Hepsibelle limited edition kits are nearly all gone! I really enjoyed collecting all the elements to make these special kits, from ordering the cabochons to be cut, to finding vintage glass beads in just the right colours; so it may be a while before I’ll amass enough for a new edition in new colours. 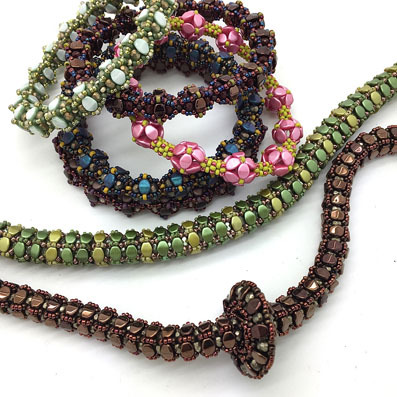 Meanwhile, if you’re a collector of beads yourself, and in search of a pattern to play with, the Hepsibelle tutorial is now available in the pdf store here. 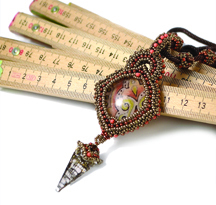 You’ll need a 30×40 cabochon, seed beads in sizes 8, 11 and 15, 8mm chatons; then lots and lots of accent beads, crystals, drops, daggers, druks, pressed glass… the more the better. 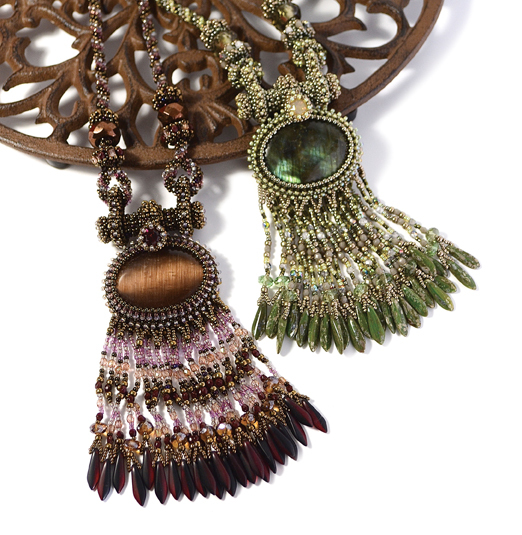 Hepsibelle is a versatile design, ready for you to add your own special mix of beads and colours. Send me a picture when you’re done, I’d love to see your creation. 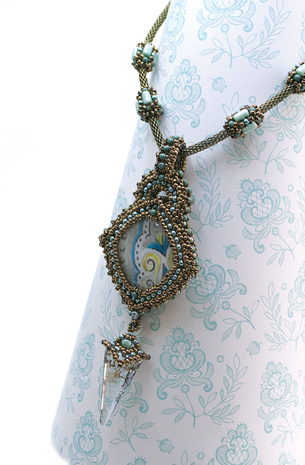 An Elizabethan inspired necklace which I adored teaching. Now the kits are released for everyone who couldn’t make it to a class. 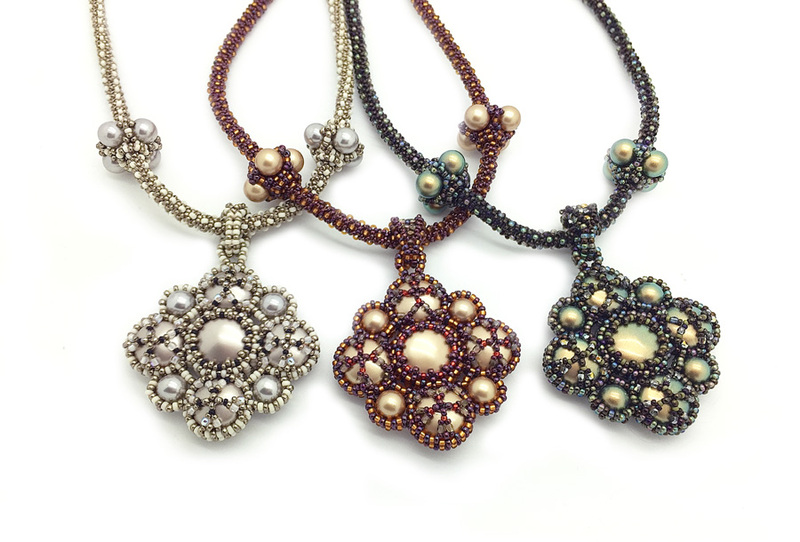 There are three colourways to choose from with a lavish abundance of Swarovski pearls. I wear mine with a t-shirt, but Bethany can dress up or down to suit your mood. The kits are here. If you are in need of just the pattern you can find it in the pdf store here.